Leos think of themselves as the king or queen of the jungle and that can make a relationship interesting. Leos in love are bold and outspoken and have a tendency towards bossiness. They need a partner who will stand up to them. Leos in relationships do not do well with people who let them get their own way all the time, as they tend to walk all over those people. Leos thrive on challenge and they will quickly lose interest in a partner who doesn’t challenge them. While dating a Leos, they need lots of attention and praise. At times dating a Leo can get exhausting, because they need so much attention. However Leos are equally attentive to their mates and love to lavish attention and compliments and plan elaborate surprises. Leos are very much into big gestures. So if you want to romance a Leo, you need to figure a way to sweep them off their feet in the boldest, most public way possible. Leo men in love have very strong personalities. From the moment they enter a room, they tend to be the center of everything. They exude charm and confidence and this carries into their love life. Leo males are used to going after what they want and getting it. They are very charming and persuasive lovers and they enjoy the art of romance. Being wooed by a Leo man is being off on an exciting whirlwind. As much as they love the chase, Leo men also love getting married. Leos like having a soul mate, someone to share their lives with. And they can be mind-blowing sexual partners in bed. Leo guys are very protective of their mates, almost to the point of being possessive. You may find your Leo man to be a little over-bearing at times and if you are looking for a causal relationship, he may not be your best bet. Like their male counterparts, Leo women tend to attract a lot of attention. They tend to have outgoing personality and a lot of charisma. It’s hard not to like a Leo female and it’s easy to fall for her. Leo women tend to be flirtatious, so it’s hard to know if she’s serious or not. However, Leos who date tend to play it fairly straight. So if you make romantic overtures she will either be charmed by them or let you down gently. Leo women love to be romanced. They love big gestures, but also small ones. The best way to romance a Leo woman is to bring her flowers, but also to give her lots of time and attention and make sure that she knows that she is important to you. Like all Fire signs, Leos do best with Fire and Air signs because of complementary natures. 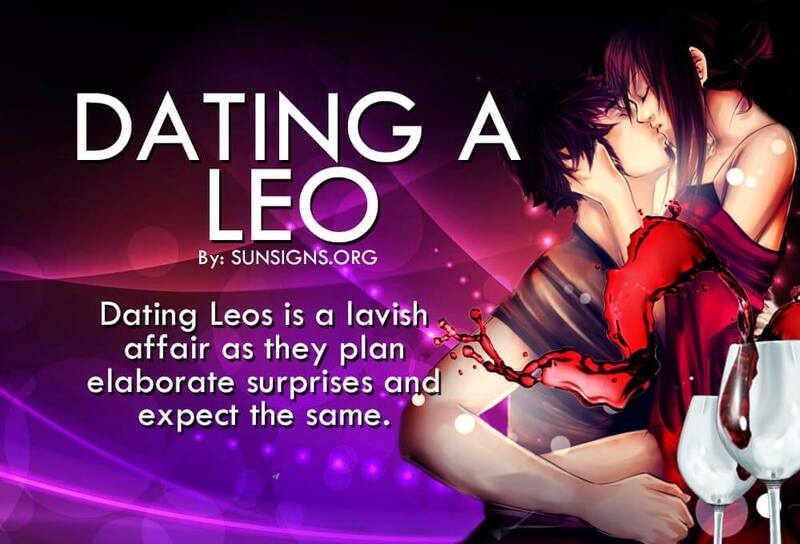 The best love compatibility for a Leo are made up of these signs. The best match is the Leo Aquarius zodiac match. These signs are very different, Aquarius’ are more laid back, but that is one of the things that makes them such a good match. Aquarius’ tend to make a great balance for the domineering Leo. The other best matches for Leos come from their feel Fire signs: Leo Aries and Leo Sagittarius, who also have bold, passionate natures, which makes for a very intense pairing. The incompatible matches for a Leo come from Earth and Water signs. Capricorn are too grounded to be a good match for a Leo and are not likely to give you the constant attention that you crave (Leo Capricorn). Virgo’s tend to be perfectionists, which conflicts with a Leo’s impulsive nature and leads to many arguments (Leo Virgo). Leo and Pisces too do not do well, who are very emotional and need praise as often as Leos do, but also need gentle handling, which Leos aren’t great at.